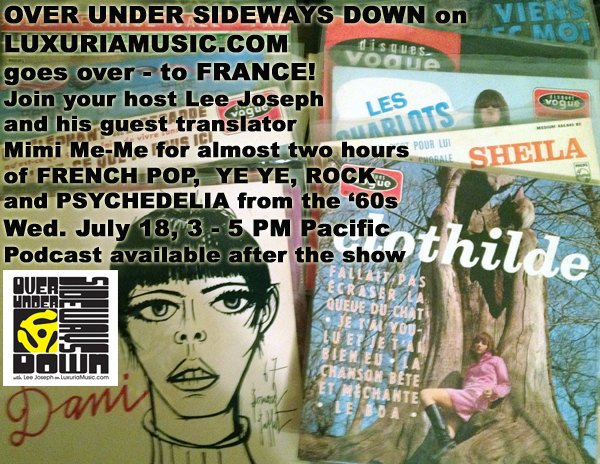 This Wednesday, July 18 at 3pm – 5pm Pacific, tune in LuxuriaMusic.com‘s “Over Under Sideways Down” as your host Lee Joseph and his guest translator Mimi Me-Me play almost two hours of French Pop, Ye Ye, Rock and Psychedelic tracks from the ’60s featuring Dani, Clothilde, France Gall, Serge Gainsbourg, Brigitte Bardot, Jacques Dutronc, Karen Bessy, Henri Salvador, Petula Clark, Les Charlots, Stone, Jacqueline Taieb, Shelia, 5 Gentlemen, Michael Polornoff and many more including a French Canadian set! A podcast will post on LuxuraMusic’s Facebook page shortly after the show ends – come back to the Dionysus blog for a podcast link and play-list! a Classic Fashion Show and Tiki Oasis Pre-Party! On Thursday, July 19, Trader Vic’s and Tiki Oasis present a Classic Fashon Show, with clothing provided by Retro Diva. Models include members of The Devil-Ettes and their groovy friends! All clothing and fashion items will be available for purchase. Hang out in the bar or make dinner reservations. The models will walk through the dining room during the fashion show – it’s old school style!